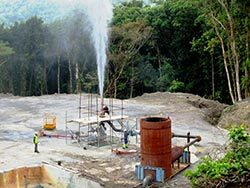 The Ministry of Public Utilities, Energy and Ports developed a program to start the exploitation of the Geothermal Resources of the Caribbean Island of Dominica. At this end, following the surface geoscientific exploration performed by BRGM, the Ministry selected ELC as consultant in charge of the further development from deep exploration to feasibility study of power plants and electric interconnection with neighboring Islands (Guadeloupe and Martinique). The services focus on review of the surface studies and siting of exploratory wells, follow up of drilling and testing, resource evaluation & development plan, feasibility studies, preparation and supervision of the complementary studies, coordination among donor organizations, capacity building & training of ministry staff. The main objective consists in transmitting the power generated from power plants, in Benkulu and in South Sumatera, to the load centers in South and Central Sumatera. The interconnection was made by means of a 68 km, 150 kV transmission line from Lubuk Linggau to Curup and a 116 km 275 kV transmission line initially operated at 150 kV from Lahat to Lubuk Linggau. Construction of new 150 kV substation in Lubuk Linggau, expansion of Lahat and Bukit Asam 150 kV substations, construction of new 150 kV facilities at Curup 70 kV substation including the 150/70kV interbus transformer and relevant 70 kV transformer bay. Hartha Project is aimed at the rehabilitation of two 200 MW Thermal Power Units near Basra, Iraq. The two units were partially destroyed during the First Gulf war. Scope of the work assigned to ELC is to support the final Client in the development and management of the project, to assess the status of the units and of the equipment available at site, to perform inspection and factory tests to the sub-suppliers, to witness the required shop tests, and to supervise the Engineering, Procurement and Construction phases performed by the Main Contractor. Fast Track Project for three gas turbine power plants is aimed at the installation of eight new gas turbines in the three different Iraq sites of Karbala, Hilla and Taji, for a total capacity of 660 MW. Works assigned to ELC consist of the Owner’s Engineer services, including the preparation of EPC tender documents, the assistance during EPC contract award, the assistance in project management, the review and approval of EPC detailed design, the witness and approval of factory tests, the supervision during erection and commissioning phases. This demo has a range of guides to introduce you to the core features and basics of the template.